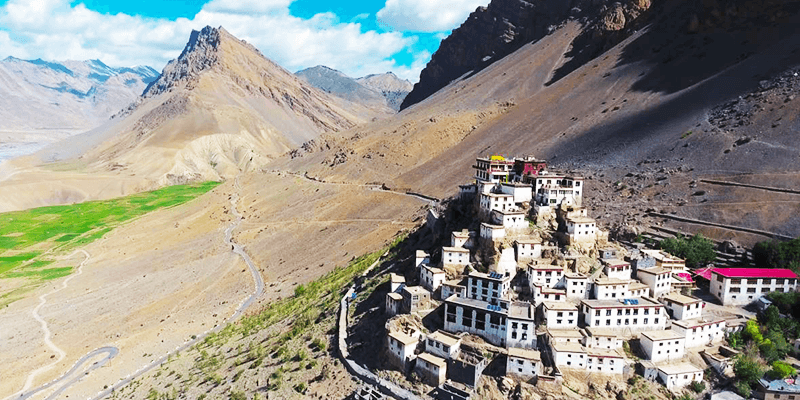 Spiti is a picturesque desolate valley located in the north-eastern part of Himachal Pradesh. Spiti means “the middle land,” and it is named so because it’s a land between Tibet and India. It is home to some of the oldest monasteries, which are more than 1,000 years old. 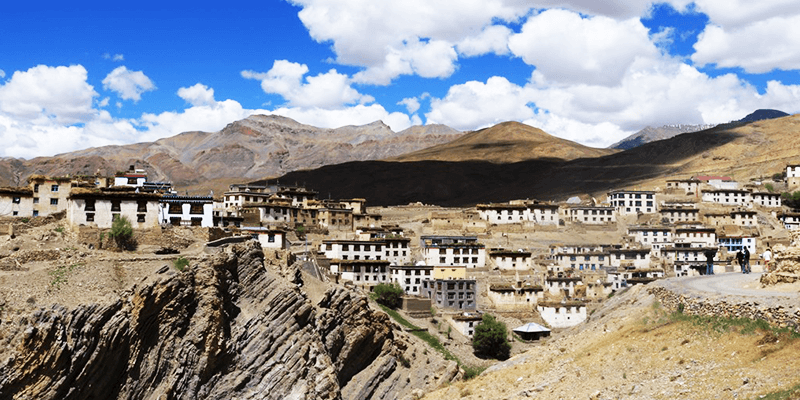 Spiti still isn’t a part of the popular tourist trail, which Ladakh is. This is largely due to its rough terrains and extremely harsh weather conditions. But there is a lot to explore and many experiences to take home from this unique land. Onward Journey: You have to take a bus or hire a cab from Shimla to reach Spiti Valley. It will take two days to reach Spiti Valley, traveling on the Shimla via Kinnaur route. There will be an overnight halt at Reckong Peo. 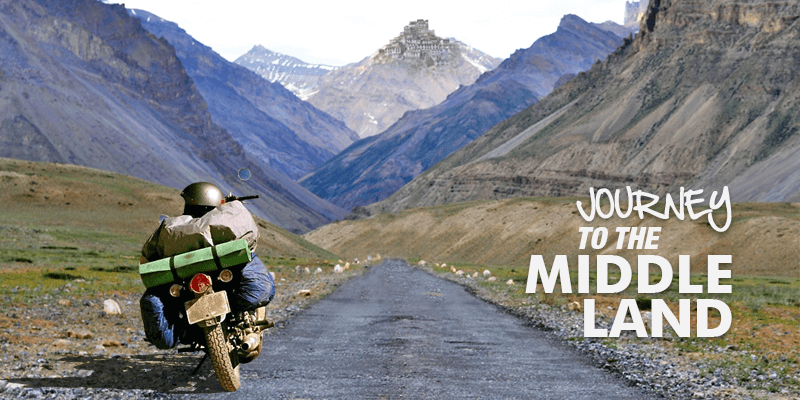 Although there are a lot of interesting things that attract adventure junkies to Spiti valley. But for the not so adventurous minded, there are many age-old monasteries, a fascinating culture and the local cuisine (that’s totally different from rest of India) to keep them engrossed. On your tour you would meet the kindest people living in the harshest climatic conditions. Surrounded by snow-capped mountains, this cold desert is a beautiful world in itself. 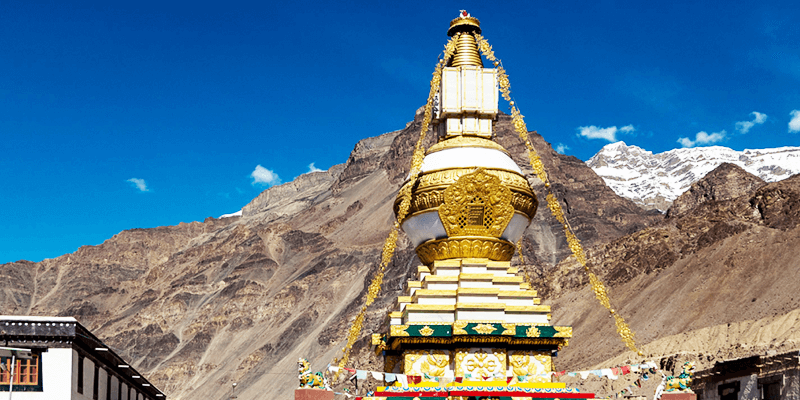 If you are in Spiti and wish to touch the grandeur and culture of the valley, you must center your trip around the following attractions. Spiti valley is home to the Mahayana (Vajrayana) sect of Tibetan Buddhism. Padmasambhava brought Buddhism to this valley in the 9th century and ever since the people of this valley have followed the non-violent and compassionate religion. Later in the 11th century AD, Rinchen Tsangpo strengthened the foundation of Buddhism in the region. Under his guidance many monasteries were established in this region. Some of them are popular tourist attractions today. Key Monastery: It is one of the biggest and oldest monasteries in the valley. Established in 11th century by Buddha’s disciple Dromtön, Key monastery is perched on a hilltop overlooking the Key village. 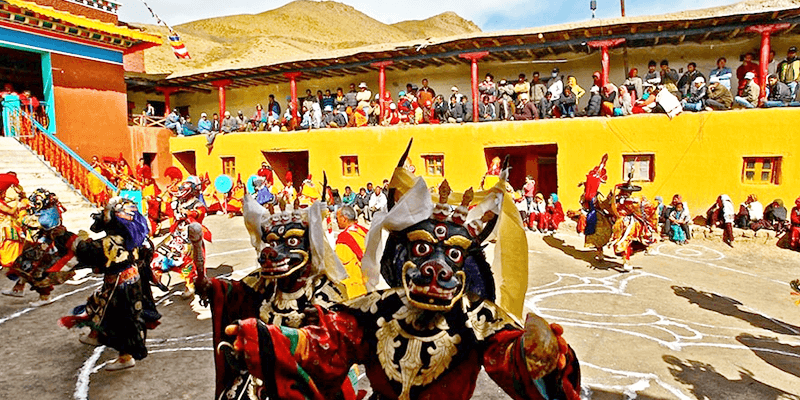 The monastery is supported by a thriving community of lamas. Apart from practicing Buddhism, more than 300 lamas study subjects like Sadhana, Cosmology and Physiology at this high altitude learning center. You will be welcomed by lamas with a cup of complementary tea as soon as enter the significantly large monastic complex, where photography is prohibited. 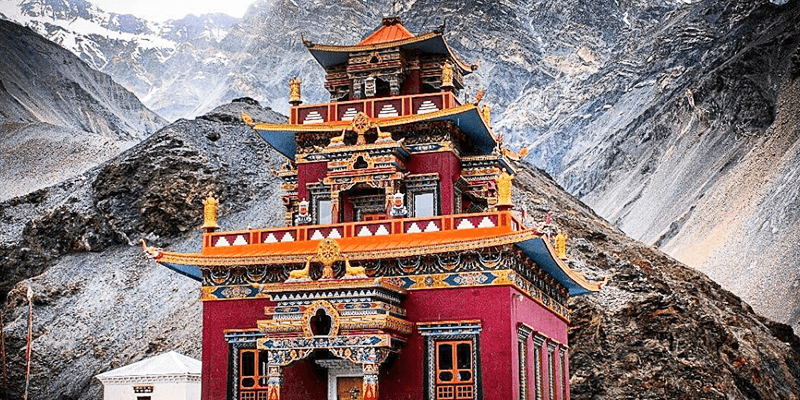 Dhankar Monastery: A road branching out at Sichling towards the upper hills introduces you to a secluded place called Dhankar. 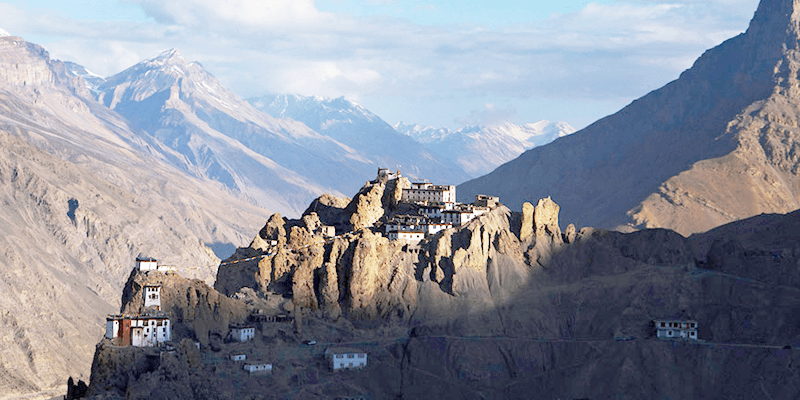 A 1000-year-old fort monastery, overlooking the confluence of Spiti and Pin rivers, seems to be hanging off the cliff. The shrine that served as a prison in ancient times is a sacred place today, housing statues of Vairochana or Dhayan Buddha. Darkness engulfs you as soon as you enter the monastery, as there is only a small window to let in sunlight. This is done to protect the ancient wall murals and Thangkas from sunlight and heat. Lamas at this monastery would be glad to offer a guided tour. You can witness the solacing prayer hall and century-old idols inside. Tabo Monastery: Popularly known as the ‘Ajanta of Himalayas,’ this monastery was founded more than a millennium back in 996 A.D. by Richen Zangpo as an advanced center for learning. A number of wall paintings and murals adorn the interior walls of the monastery. Small doors usher you into the prayer hall where century-old paintings and murals can be seen hanging from the mud walls. Photography is prohibited inside the monastery. The Kalachakra (group meditation) was conducted by His Highness the Dalai Lama in the monastery complex in 1996. Geu (or Giu): It is a small settlement at an altitude of 10,000 feet, between the towns of Sumdo and Tabo. The village is as mysterious as it can be. Curvy roads accompanied by wind-sculptured moonscapes on one side and a deep gorge on other side lead you into the Geu village. The village consists of a handful of mud houses. In one corner of the village lies a famous shrine with 550-years-old Tibetan mummy resting inside a glass box, whose teeth are still visible through his dried lips. The crouching mummy of 15th century belongs to the Buddhist monk, Sangha Tenzin. The mummy has his chin resting on the knee and one hand wrapped around the legs. The entire body dried up through a natural process, and even today its eyes and hair are intact. The mummy was uncovered, back in 1975, under a stupa during an earthquake. Mane: It is located 45 KM away from Kaza, and the only way to get there is through a private taxi – as no buses ply to Mane village from Kaza. The barren land guarded by mountains has shades of yellow and gold as you look around. 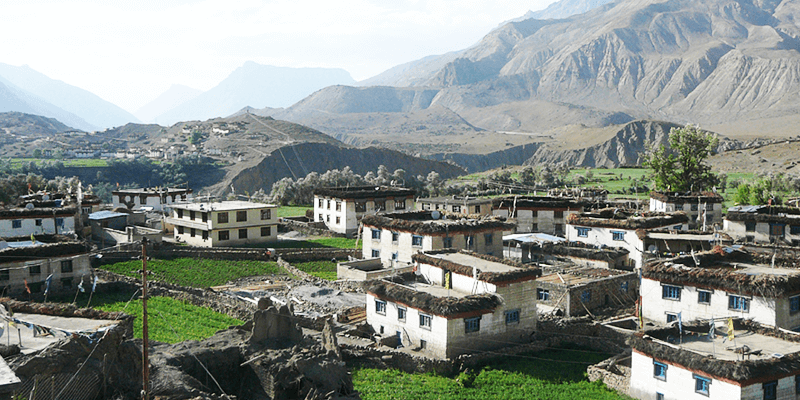 Kibber: Also known as one of the highest motorable villages in the world, Kibber is a village with handful of mud houses and snow-capped mountains as its backdrop. Life runs at a slow pace here, as oxygen level in the air is quite low, which you can figure out quite easily while taking a small walk. You will feel out of breath and exhausted after taking 5-10 strides. Animal husbandry and agriculture are the main occupations of the villagers. Tibetan food dominates most platters here, reason being the Tibetan Buddhist culture prevails in this beautiful region. 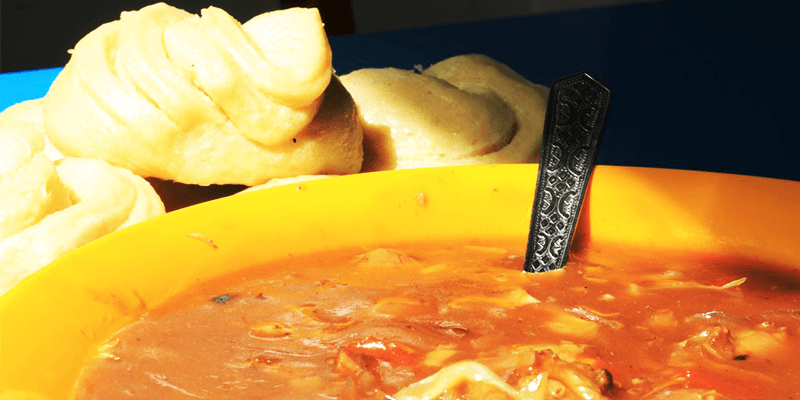 The local cuisine that you cannot afford to miss in Spiti includes Momos, Butter Tea, Thukpa, Chang (a locally-made beer) and Arkah (a locally-made whiskey). Spiti valley is also famous for its abundance of restaurants serving quality Israeli food. While at the valley, do taste some of their flavored and aromatic tea (made using ingredients such as dry fruits, salt, mint and honey). Please tell me how can i save your article for reading next time …. Hi,I check your blog named “RailYatri blog – A Trip through the unique culture of Spiti” regularly.Your story-telling style is witty, keep up the good work! And you can look our website about powerful love spells.